Heart (rat), fixed with 2.5% Glutaraldehyde, OsO4 stained, Spurr's embedded, cut with the ultra sonic knife, section thickness setting 15nm. J. Nebesarova, Institut of Parasitology, Ceske Budejovice, Czech Republic. Imaged by Petr Stepan in LVEM 5 at 5kV, Delong Instruments, Brno, Czech Republic. 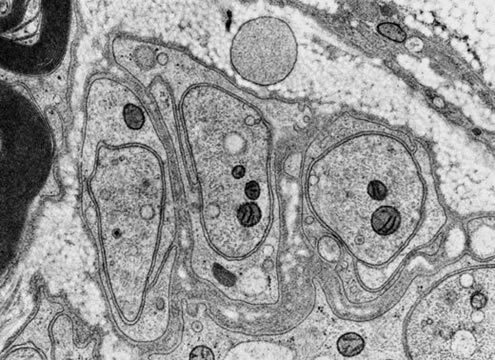 Human keratinocyte. HP frozen, substituted with methanol -0.5% uranyl acetate at -90°C, embedded in Lowicryl HM20 at -40° C. Cut with the ultra sonic knife, section thickness 50nm. The cell nucleus (N) is surrounded by an area rich in tonofilaments (T). 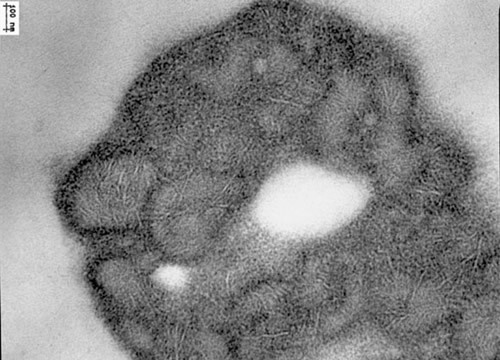 Several electron dense melanosomes (M) are apparent on the top left side of the cell. 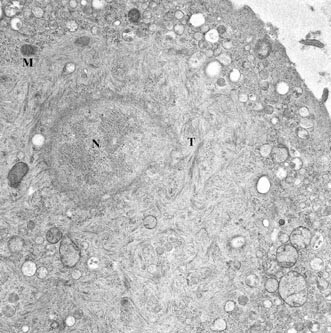 The peripheral area of the cell contains numerous vesicles displaying a regular spherical appearance. Danièle Spehner, E0345 INSERM, EFS-Alsace, Strasbourg, France. 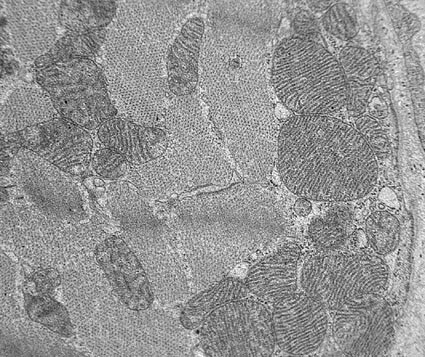 ABS, stained with OsO4, sectioned at room temperature with the ultra sonic knife, section thickness 50nm. Note the almost perfect spherical shape of the large rubber particles and the preservation of the inclusions inside. Also the smaller dense rubber particles are well preserved. B.Vastenhout, Dow Benelux N.V. Terneuzen, The Netherlands. Impact modified PP, stained with RuO4, sectioned at room temperature with the ultra sonic knife, section thickness 50nm. 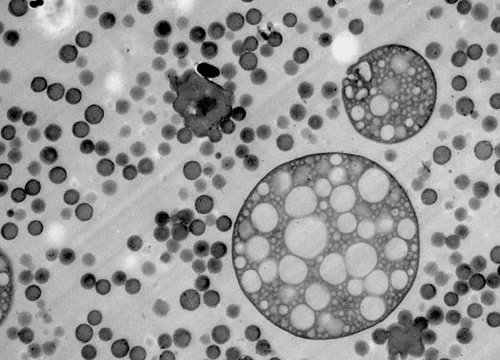 The EP-rubber particle is built from tiny agglomorated particles. The original particles have a more crystalline core (brighter with lamellae) and a more amorphous shell (dark). B.Vastenhout, Dow Benelux N.V. Terneuzen, The Netherlands.